Seating in a kitchen is so important. Luckily, this huge kitchen island and bar area made figuring out seating super easy. These bright blue bar stools added a pop of color and are the perfect spot for guests to sit down and chat with our clients as they finished preparing the meal. We used custom leather chairs at an oval kitchen table in order to keep the space open. The lighting in this kitchen was definitely not a problem. 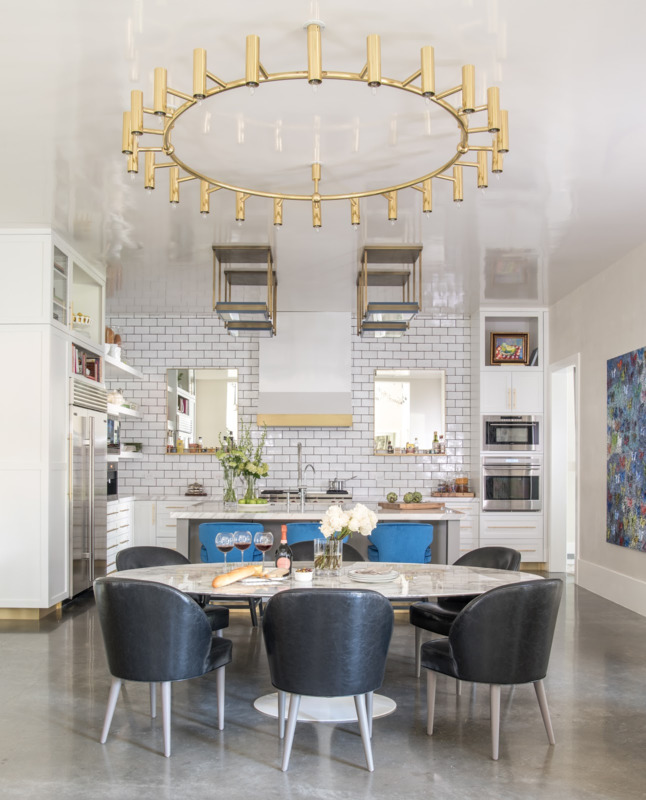 It was already filled with a considerable amount of natural light from the living room, but because the space was so large it called for some eye-catching lighting fixtures over the center island and kitchen table. And by using the two lights, it made the space feel separated without adding any visual distractions. I love using open shelves in a kitchen. It’s a fabulous space to showcase beautiful cookbooks, coordinating dishes and puts fresh herbs easily within reach. Not to mention having the herbs out makes the kitchen smell fabulous! In a kitchen, one thing you can never have too much of is storage, but you don’t want it to be the focal point. These matte gray shaker style cabinets surround the island and provide lots of hidden, but easily accessible storage. 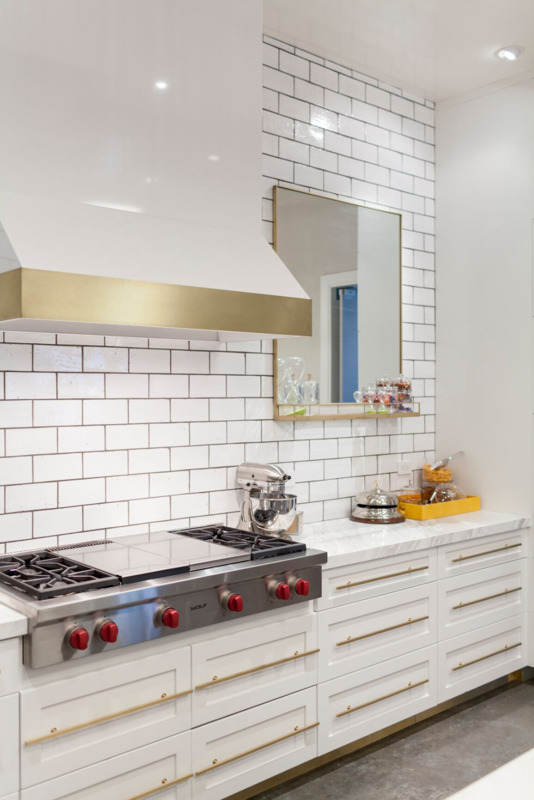 The other kitchen cabinets were painted in a bright white to seamlessly transition the white subway tiles to the contrasting exposed concrete flooring. Wine storage was also important for our clients. They knew that they wanted to keep the kitchen as open as possible, so they opted to put the wine room directly off the kitchen. 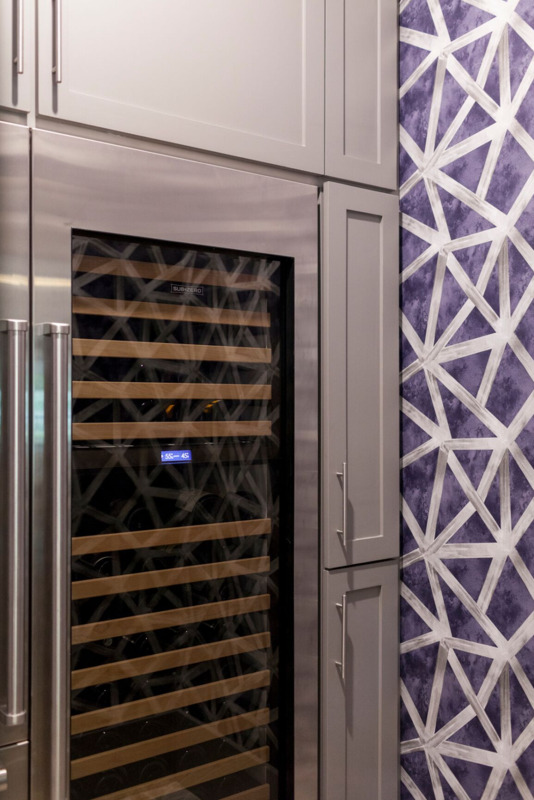 It was a great way to keep the wine accessible, especially while they’re entertaining or having a date night at home, without it being in the way. I love how we used mixed metals to tie everything together. 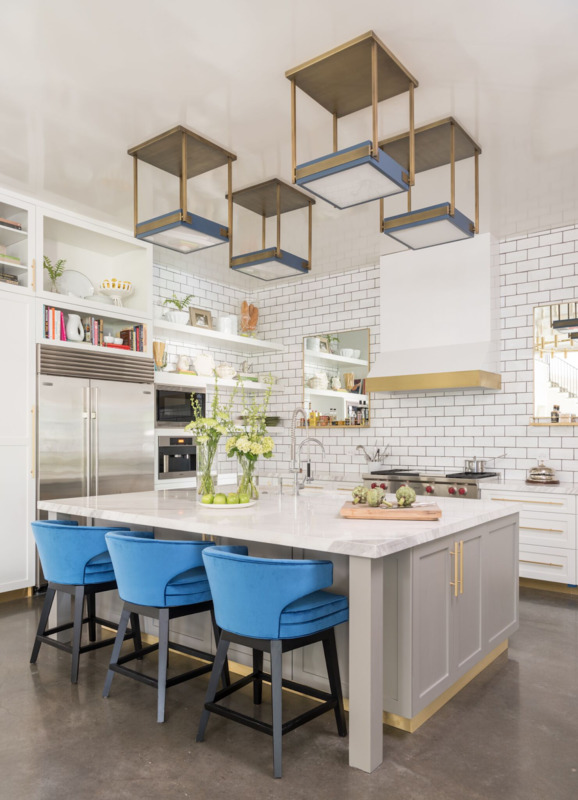 Gold is definitely the hero in this kitchen shown in the lighting, drawer pulls, and even the baseboard around the island itself. But we wanted to make sure to tie in the silver appliances as well. We incorporated cooler tones in the space through the gray in the cabinets and the blues in the lighting and bar stools. From the classic subway tile to the extensive storage to the gorgeous lighting fixtures, it’s a space where our clients can gather and relax with their guests over a glass of wine and a delicious meal. This kitchen is proof that a kitchen can be functional and beautiful at the same time. And I don’t know about you, but I could definitely spend some time in this kitchen. Don’t you agree? 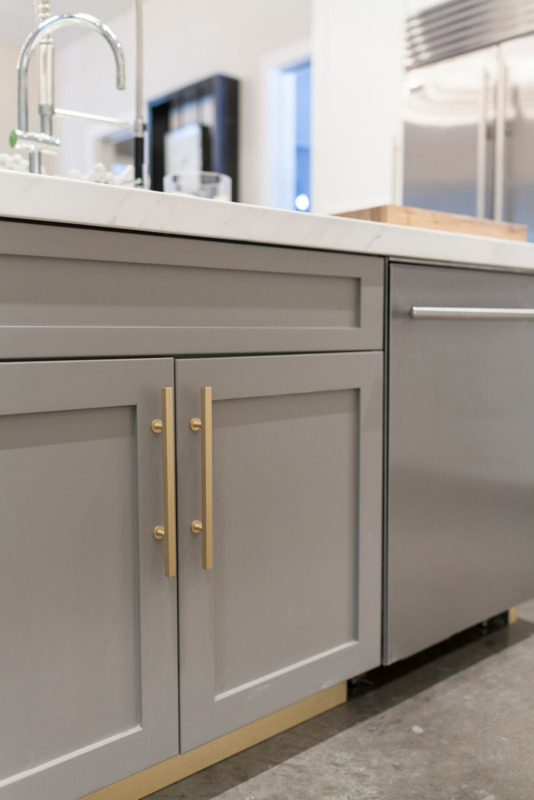 To browse more of my favorite kitchen spaces, head over to or check out my .